Reflections on “Taps” by Plinio Corrêa de Oliveira. Such are the words of the sublime bugle call “Taps.”1 It is played when the troops retire for the day. It is also sounded at funerals when veterans make their final retreat into eternity. To the Catholic, the call is symbolic of two very different yet connected things. On one hand it represents the Catholic dignity inside death, suffering and defeat. On the other, there is a note of Catholic repose. The bugle call contains something of Christian resignation. It starts out loud and slowly diminishes in volume, always displaying a dignity. One has the impression that the leitmotif of the call rises upward to heaven. As it is played, the call is increasingly distant and sounds more subdued. As it fades and reaches its final note, there is the impression that the hymn has gathered itself together and rests into the splendors of the Eternal Father. 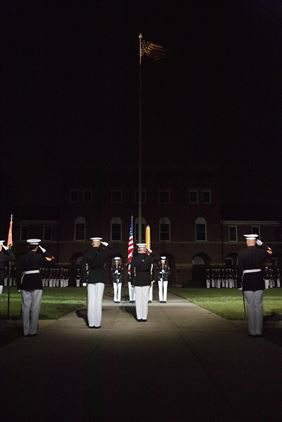 Lowering of the Colors during the Evening Parade at Marine Barracks, Washington, D.C.
At funerals, one senses that the hymn hovers so high above everything that it seems to have left the earth although it promises a return. In the insistence of its main sequence, the hymn seems to say: In my death, I am so high that no earthly vicissitude can touch me. Nothing can reach me; nothing can wound me now. In my defeat, I now hover above everything, resting in a superior order of things, in the splendors of the Eternal Father until my return at the final judgment. There is also the element of repose which differs so much for the modern person who simply plops down anywhere without dignity. This is a truly Catholic repose in which the spiritual side of man is especially highlighted. It represents the joy and peace of duty done. It is full of idealism with a note of melancholy. There is a tranquility, suavity and sweetness that follows the person into a repose, yet ready to fight again upon rising. “Reflections on ‘Taps’” is based on a meeting of Prof. Plinio Corrêa de Oliveira (Dec. 30, 1968). It has been translated and adapted for publication without his revision. –Ed. The original set of lyrics meant to accompany the music, written by Horace Lorenzo Trim. Cf. https://en.wikipedia.org/wiki/Taps, assessed August 31, 2017. This entry was posted in Plinio Corrêa de Oliveira and tagged bugle call, Catholic, Catholic repose, Christian resignation, death, dignity, Eternal Father, Final Judgment, military, military honor, Order, Plinio Corrêa de Oliveira, reflections, suffering, superior order, Taps, troop retire by Plinio Corrêa de Oliveira. Bookmark the permalink.